Biomedical Paper Presentation: What are Neuroprosthetics? Kush Tripathi January 4, 2012 January 4, 2012 No Comments on Biomedical Paper Presentation: What are Neuroprosthetics? Neuroprosthetics (also called Neural Prosthetics) is a discipline related to neuroscience and biomedical engineering concerned with developing neural prostheses, artificial implantable devices to replace or improve the function of an impaired nervous system.Neuroprosthetics are the set of physical devices that interact with the brain or other neural tissue to augment, restore, or otherwise impact function. Neuroprosthetics are electrical stimulation technologies that replace or assist damaged or malfunctioning neuromuscular organ systems and attempt to restore normal body processes, create or improve function, and/or reduce pain. These systems are either implanted or worn externally on the body. Such assistive devices range from intramuscular stimulation systems designed to limit limb atrophy in paralysis, to implanted bladder voiding systems and more complex implanted neuromuscular control. 2. Augmented body parts will be able to be fitted to the body, and controlled by the brain as if you were born with them – after a little training, without conscious thought. The first cochlear implant dates back to 1957. Other landmarks include the first motor prosthesis for foot drop in hemiplegic in 1961, the first auditory brainstem implant in 1977 and a peripheral nerve bridge implanted into spinal cord of adult rat in 1981. Paraplegics were helped in standing with a lumbar anterior root implant (1988) and in walking with Functional Electrical Stimulation (FES). Regarding the development of electrodes implanted in the brain, an early difficulty was reliably locating the electrodes, originally done by inserting the electrodes with needles and breaking off the needles at the desired depth. Recent systems utilize more advanced probes, such as those used in deep brain stimulation to alleviate the symptoms of Parkinson’s disease. Over the past four decades, research in neuroprosthetic has generated a handful of clinical successes and has gained lasting acceptance in the scientific community noteworthy advances have been made. Whether caused by disease, an accident, or a necessary surgery, damage to major nerves extends beyond the cellular level. Without speech, completely immobile individuals can be cut off from friends and family. Loss of limb function to paralysis may trans-late into a loss of independence and good health. And the deaf or blind may be severed from their work in addition to the sights and sounds of everyday life. Scientists are hotly pursuing a means to repair nerves, in particular by using stem cells to replace or support function of injured neurons. However, this field is in its early stages, and learning how to manipulate therapeutic cells will likely take several years. their best, cannot match the performance of natural tissues. Certainly, we are far from the times of Luke Skywalker, when replacement robotic parts can be installed upon the night of an injury. Nevertheless, application of this technology has realized initial steps toward this dream and offered new hope to many patients. 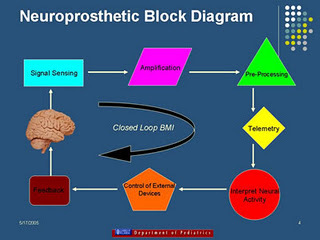 A Motorprosthetics device, or brain computer interface, is a machine that can take some type of signal from the brain and convert that information into overt device control such that it reflects the intentions of the user’s brain. In essence, these constructs can decode the electrophysiological signals representing motor intent. With the parallel evolution of neuroscience, engineering, and rapid computing, the era of clinical neuroprosthetics is approaching as a practical reality for people with severe motor impairment. In the somatic nervous system attempts to aid conscious control of movement includes Functional electrical stimulation and the lumbar anterior root stimulator.The Brain Gate system is a neuromotor prosthetic device consisting of an array of one hundred silicon microelectrodes; each electrode is 1mm long and thinner than a human hair. The electrodes are arranged less than half a millimeter apart on the array, which is attached to a 13cm-long cable ribbon cable connecting it to a computer. This experimental paradigm opens many new questions about optimal neural decoding, techniques for neuronal sampling. Where a spinal cord lesion leads to paraplegia, patients have difficulty emptying their bladders and this can cause infection. From 1969 onwards Brindley developed the sacral anterior root stimulator, with successful human trials from the early 1980s onwards.This device is implanted over the sacral anterior root ganglia of the spinal cord; controlled by an external transmitter, it delivers intermittent stimulation which improves bladder emptying. It also assists in defecation and enables male patients to have a sustained full erection. Researchers are attempting to build motor neuroprosthetics that will help restore movement and the ability to communicate with the outside world to persons with motor disabilities such as tetraplagia or amyotrophic lateral sclerosis. To capture electrical signals from the brain, scientists have developed microelectrode arrays smaller than a square centimeter that can be implanted in the skull to record electrical activity, transducing recorded information through a thin cable. 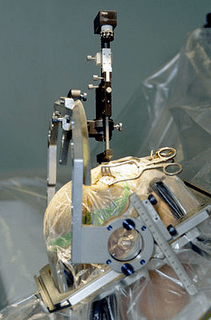 The technology behind motor neuroprostheses is still in its infancy. Investigators and study participants continue to experiment with different ways of using the prostheses. Having a patient think about clenching a fist, for example, produces a different result than having him or her think about tapping a finger. The filters used in the prostheses are also being fine-tuned, and in the future, doctors hope to create an implant capable of transmitting signals from inside the skull wirelessly, as opposed to through a cable. In 2002 an implant was interfaced directly into the median nerve fibers of the scientist Kevin Warwick. The electrode array inserted contained 100 electrodes, of which 25 could be accessed at any one time. The signals produced were detailed enough that a robot arm developed by Warwick’s colleague, Peter Kyberd, was able to mimic the actions of Warwick’s own arm and provide a form of touch feedback via the implant. Sensory and motor prostheses deliver input to and output from the nervous system respectively. Theodore Berger at the University of Southern California defines a third class of prostheses aimed at restoring cognitive function by replacing circuits within the brain damaged by stroke, trauma or disease. Work has begun on a proof-of-concept device a hippocampal prosthesis which can mimic the function of a region of the hippocampus a part of the brain responsible for the formation of memories. A neuroprosthetic device (arrow) translates brain signals into actions on a computer screen, allowing a paralyzed man to draw, check e-mail, and play games. on a computer screen. The brain-computer interface has the potential to surpass the shortcomings and enhance both communication and motor functionality. In a concerted effort with Massachusetts General Hospital, Brown University, and CY-be kinetics . An implant of 96 electrodes into the primary motor cortex of the brain read the changing voltage of neurons that control voluntary movement . The signals are digitally filtered and interpreted in an external device then sent to a machine to trigger actions. Signaling at some electrodes was lost in one patient, possibly due to a short circuit in the array several months after the device’s insertion. Electroencephalography (EEG) interfaces, which take readings of brain activity from the scalp. These systems do not support the high control conferred by the electrode array, which can monitor many individual neurons; EEG interfaces also require weeks to calibrate to a given user whereas Brain Gate requires only a matter of minutes (3). As implants mediate increasingly complex functions and become more durable, they may become the preferred long-term medium. Non-invasive devices, on the other hand, may be better suited to fulfill short-term needs. The most successful neuroprostheses, the cochlear implant has allowed over 100,000 people to hear again. Sound detected from a microphone is coded into signals, sent from a transmitter to an implant that stimulates electrodes in the cochlea, and processed in the brain’s auditory cortex. In common forms of blindness, information-gathering cells called photoreceptors die. Retinal prostheses make sure their targets, retinal ganglion cells, are stimulated by electrodes on the retina’s surface (epiretinal) or under it (sub retinal). Input received by the visual cortex may originate from a camera/processor or light alone. Physical problems that frequently afflict the paralyzed. Bionic devices are not limited to communicating motion-related tasks, but can also mimic the senses. Some cells are stimulated by frequencies as low as 20 Hz, others as high as 20 kHz, and many others register pitches in between. When any combination of these cells fire, their signals are relayed to the auditory nerve, the auditory brainstem, and ultimately the auditory cortex of the brain. The bionic hearing differs in multiple ways. Perhaps only 22 electrodes may be available to distinguish the several kHz ranges of frequencies, whose detection usually requires thousands of hair cells.The importance of this bridging process is reflected in the differential ability to learn languages. While the implant does not achieve the natural level of acuity, its overall functionality peaks to its success, as does its wide distribution to over 100,000 adults and children worldwide. Both conditions involve massive death of photoreceptor cells, neurons of the outer retina that detect light and color. Instead of stimulating these lost cells, Human’s bionic system feeds signals from a spectacle-mounted camera to a 4×4 electrode array on the inner retinal surface The result is a crude form of vision with 16 Pixels, instead of the millions naturally achieved by the eye. Medtronic and Advanced Bionics are significant commercial names in the emergent market of Deep Brain Stimulation. Cyber kinetics is the first venture capital funded neural prosthetic company. Research into neuroprosthetics is an ongoing and cutting-edge area of science. We should expect to see many more developments in the future, some of which will challenge common assumptions about the interface between the mind and machines. The demonstrated potential of neural prosthetics has engendered both hopes and concerns. Once normal hearing and vision are restored, our sensory repertoire could conceivably be expanded to include infrared wave-lengths or ultrasound. Replacement limbs could feature increased power and utility than organic ones. If the mind today can move a robotic arm, tomorrow’s devices might allow manipulation of an entire robot. Implant engineers continue to face hurdles, such as supplying power to electrodes and preventing corrosion of metals in the body’s aqueous and oxygenated environment. Nature reports that by simply recording the brain’s electrical signals from electrodes on the scalp, researchers have enabled trained participants to reliably control computer equipment, a feat normally associated with physical implants in the brain. One of the disadvantages, well known to scientists who use forms of EEG recording to research the brain, is that the skull ‘smears’ the signal from the brain. Furthermore, muscle activity can introduce large amounts of electrical noise into the recording. With the development of ‘smart’ chips, which have thousands of chemically sensitive switches on their surface, we can in theory now create sensors to replace these sensory neurons. A growing body of research indicates that controlling seizure activity can be achieved through direct or indirect (vagal nerve) brain stimulation. individuals. The advancement of new antiepileptic therapies with novel, rational mechanisms of action into clinical testing is an essential process toward the creation of new treatments for drug refractory disease and/or therapies with fewer side effects. Not only that but also the hand, legs interaction takes place by using soft wares and hard wares which is equivalent to the electronic circuit which is easy to implement. Not only that but also all parts of the man parts like kidney, teeth also. Electrode systems, from micro wires and platinum disc electrodes to penetrating microarrays, are capable of effectively and chronically interfacing with the human nervous system which increases the capability. Neuroprosthetic devices, and have curbed neuroprostheses markets to the point of commercial non-viability. As such, Medicare coverage and reimbursement policies constitute both the most pernicious and most easily changed hurdle faced by neuroprostheses commercialization efforts. Neuroprosthetic devices had some concrete success stories in the past few years, and the stage was finally set for developing them, not to just monitor and interact with brain signals, but control external body parts as well. Christopher Reeve was among the first users of this new system. Therapy System furnished improved circulation, cardiopulmonary exercise, reduced spasticity, more range of motion for his joints, along with added protection against undue pressure and skin breakdown. 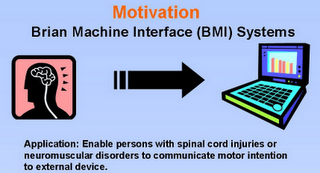 Muscle stimulation acts as a prosthesis by replacing aspects of an incapacitated nervous system. In patients with upper motor neuron damage (spinal cord injury, stroke, cerebral palsy, multiple sclerosis, head injury), it bypasses the impaired part of the brain or cord and stimulates the motor nerves directly. This makes the muscles contract. The stimulator’s microprocessor and controller execute and coordinate commands to each muscle, instructing which ones to contract and which ones to relax at any given moment. A muscle stimulator’s level of sophistication determines the complexity of movement it imparts to the body as well as what level of muscle force and firing sequence to emulate. Muscle stimulation can be used in patients with incomplete spinal cord injury to strengthen muscles and reduce spasticity, so that the body operates more efficiently and effectively. For example, many persons with incomplete injuries having voluntary control over the quadriceps can stand and walk longer and more effectively when the quadricep muscles are strengthened. Another area found electrical stimulation to be immensely helpful is the reduction of chronic pain. While most clinicians are familiar with TENS, few are aware that muscle stimulation can be used as well. The difference is that muscle stimulation is a stronger stimulus and is capable of contracting and relaxing muscles in a cyclic manner. My clinical experience shows that muscle stimulation is better at blocking pain than TENS. The purpose of the garment is to help align and hold electrodes in place. The material comprising the body of the garment is a flexible spandex. The electrodes are made of silver cloth and are highly conductive. I make the garments in such a way that wires do not interfere with or restrict body movement. The garment fitting is a three to five stage process which varies, depending on the complexity of the case. Patients doing therapy can don the garment, then remove it after a few hours, or if being used for pain relief, it can be worn under clothes throughout the day, sometimes even at night when the patient sleeps. Because the garment is worn directly on the skin and is worn for extensive periods of time, it must fit just right. Otherwise, skin irritation and breakdown might occur. In present days with different types of neural disorders and malfunctioning of human organs. Loss of various vital organs of human body due to various reasons lacks to victim to lead a normal life. Neuroprosthetics has been boon to these victims to overcome their handicaps. The new technology which is getting advanced in all parts of human body from the past four decades is bringing a good change in the Neuroprosthetics world. But Neuroprosthetics research will not be easily or quickly overcome, but existing technology offers solutions sufficient for meaningful clinical applications. Physical therapy in not the only venue for electrical simulation and Neuroprostheses. Neuroprostheses industry may prove instrumental in uniting venture capilists with researchers, and in helping both groups to identify further broadly applicable trends in Neurotechnology. All current Neuroprosthetics devices rely on the electrode-nerve interface as the sole means including neural response, and thus restored function.